Background: in the early 1990s Mirja Ronning was a Biblical Hebrew lecturer at The American Institute for Holy Land Studies (now JUC). She was coordinating the Hebrew program there and had already established a track for OT translators within the two-year MA in Hebrew degree. A few students chose this special track for translators, among them also a British consultant from Ivory Coast, Julie Bentinck, who eventually introduced Mirja to the great needs for biblical language training in French speaking Africa. In 1992-93 Mirja was teaching two talented translators, Peter and Zachary, from the Karamazo area of northern Uganda. They had received a good stipend to study in the American Institute of Holy Land Studies in Jerusalem. 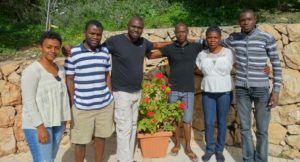 Mirja taught them Biblical Hebrew and kept encouraging them when they were discouraged and home sick, since they were at that time the only Africans at the Institute. After completing their studies they went home to Uganda and Mirja lost contact with them. His face brightened and he said immediately: “Sure, Peter X. is in a high position in the local government and Zachary Y., an Anglican priest, has finished the translation of the Bible into his own language”. Mirja was stunned. The teaching and the investment from over 25 years ago had borne fruit! Even more curious is that the fact that these two fellows, Peter and Zachary, are actually responsible for the birth of the idea of establishing a Home for Bible translators in Jerusalem! It happened when Mirja noticed how home sick and out of place they felt in the American Institute. It just hit her one day that mother tongue Bible translators need a place they can call home in Jerusalem. In addition, since her passion is the Hebrew language of the Bible, she also envisioned a study program for mother tongue translators to learn Biblical and modern Hebrew, which will allow closer familiarity with the source language and smoother translation from the original. The idea of a Home for Bible translators was born. The year was 1993. In 1994 the Rothberg International School of the Hebrew University in Jerusalem adopted the proposed study program as a special program under its name. In 1995 the first group of students arrived to participate in the program and to live in the rented apartment we had at the time. They were from French speaking West Africa. The rest is history!